We created some feedback sheets before we showed our film to our class, so it would allow them to comment on what they like about the film and what needs improving. When looking at the things written about our short film, it was evident that the main thing that was appealing to the audience was the story line of having a young character bring two families from different backgrounds together using a teddy. The idea was simple but entertaining and fit well with the message we wanted to convey and the genre of drama. Some of the camera angles we used were also appealing to the audience. Seeing the comments made on the film my group saw that the audience felt the story was shown well throughout the production. The target audience for our short film is teenage and young adults both males and females, so the feedback we received was a realistic and reliable view of how the audience would find the film because it was shown to a group of people in this category. As well as seeing the parts of the short film that were liked, getting feedback also allowed my group to see what needed to be improved and what the weaker aspects of our short film were. Lighting and sound were two main issues that we noticed were brought up a lot on the feedback sheets. many of the indoor scenes were filmed with poor lighting due to the filming schedule and times that the actors used were able to be around, and the artificial lighting is what made the scenes appear quite orange. We were advised to use the editing software to balance out the colour in some scenes. When filming the outdoor scenes, we used a boom mic for the first time which was difficult to work with to begin with. The result was that sometimes the sound was slightly quiet when Jack’s character was speaking. Furthermore, through our audience feedback we were able to see that our film could be improved with more variety in the music over some of the scenes and that the volume of the music could be adjusted slightly. From the audience feedback, I have learned that the story line we wanted to show in the film was clear and the target audience found it appealing, however there were also aspects of the film that were not as strong such as the lighting in some scenes and the sound. It took us a while to find some music that sounded like it would work with our film. We looked at a range of websites to try find the music we wanted. These pieces of paper include the script that we came up with, notes for some of the clips and notes of what each character should be wearing, etc. 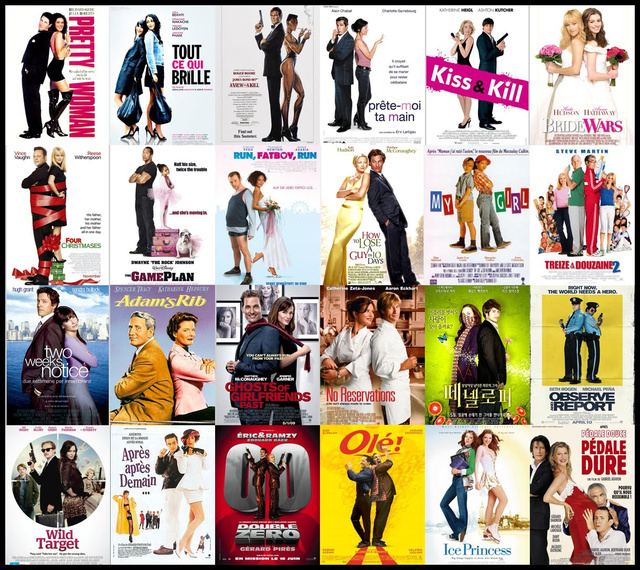 Looking at all these, there is clearly a reaccurance in the film posters, some specific to the genres shown which is romance and some action,etc. This was the last day of filming. In these pictures we are reviewing a clip that we have just filmed and are thinking of ways we could possibly make it better. We had to be quick thinking and had decisions made straight away with only a little bit of thought as the natural light kept going dull, bright, dull and then bright again so we had to make sure we got the lighting as close as we could to the clip before. This is one of the first pictures taken of us editing. In the picture we are putting the clips in order and deciding where they need cutting down to. These were some of the outfit options for Layla but she didn’t end up wearing any of these. She wears a a blue denim dress instead. Ella set up the lighting and camera this day and directed me as I was the one acting. Zahra supplied us with the Teddy Bear that we are using. She shared a picture of a few bears that she has in our group chat and we decided on the one with the blue ribbon on as it is gender neautral and the blue is easy t0 match with denim, which is our link between clothing with the Teddy, Layla and Jack. We developed the idea of usuing colours to create meaning in costume, we are going to link characters through costume colours, Jack and Paige will wear a garment of the same colour each time Jack takes notices of Paige on their walks out, Shannon and Elizabeth will be wearing contrasting colours and the day the two meet, they will be wearing a grament of the same colour. We are thinking of putting a garment on the teddy that links to all of the characters to show how the teddy is the importanat thing that can be used as a tool to bring a family together by a little boy. Through research of Game of Thrones we found that Sansa Stark was a key character who’s costumes held great importance in terms of meaning and reflecting the development of the character. The young noblewoman’s hairstyles and clothing tell a story, too, with significant, but often subtle, meaning. “All of the fashion, the hairstyles, especially with Sansa, it reflects her influences over the seasons and who her loyalties lie with,” – Sophie Turner, who plays Sansa, told USA TODAY.